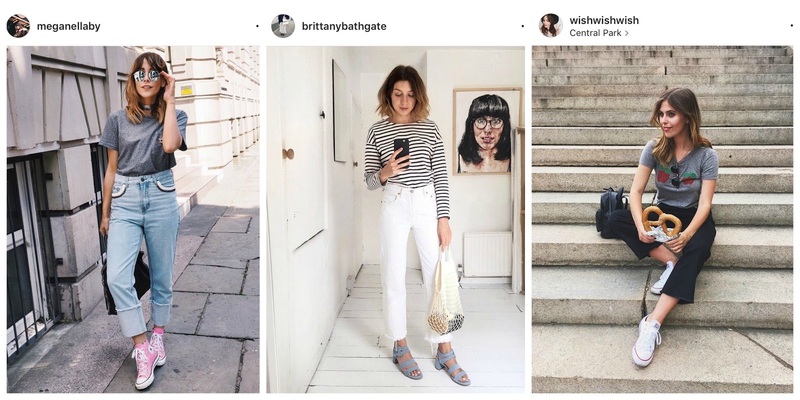 Whenever I find myself lacking in outfit inspo or need a bit of a 'girl boss' motivation, I head over to the Instagram 'liked posts' feature and have a scroll through the photos I've been liking lately. Now these range from perfect flat lays to outfits I wish I owned in my wardrobe to other fun things like piglets and keeping up with my friends travelling adventures. I often turn to Pinterest for outfit inspiration but recently even that hasn't been helping me out of my style rut in which I hate my entire wardrobe and feel like I need to 're-invent' myself. Does anyone else have those feelings? Please say you do! Anyway, these are a few of the outfits from inspiring ladies that I have been LOVING recently and wish I could add into my own wardrobe; pretty please ?? First up, Megan Ellaby AKA my total girl crush for all things style and hair. In fact I have a hairdressers appointment booked next month and a whole selection of her insta pics to try and re-create her ah-mazing textured look. ANYWAY, her style is always one I look to when I'm stuck for outfit ideas because not only is she super daring in her fun, bold and statement looks but she pulls them off SO effortlessly. My ultimate inspo right now! As well as my total envy at the amount of amazing places Carrie has been visiting lately, I'm head over heels obsessed with her travel style too! I've been following wishwishwish for years now and am 100% in awe of how well Carrie pulls off every single look, in particular this shot of her in NYC a couple of weeks ago has me absolutely needing a statement tee in my wardrobe. I love the idea of statement and slogan tees relating to the places you're visiting for a really fun 'edgy tourist' (yes I just made that up) look. I couldn't miss out the one and only Alexa Chung when talking about current style inspirations, despite the fact she is my ultimate, every day of the year inspiration. I adored this pic she posted before heading to Glastonbury fest last week and totally wish I could rock those trousers and pink cardie combo so perfectly effortlessly. And finally a quick mention to Kristabel from the blog IWantYouToKnow which I am full on obsessing over recently. I love her vlogs, love her Snapchat, love her outfits and LOVE her personality. She is such a bubbly, positive and intelligent lady that really inspires me in fashion as she also studied it at uni! I adore this photo of her rocking so patterned trousers and silver trainers; I've got my eyes peeled for some patterned additions to my wardrobe and her instagram is persuading me I need some bold prints in my life even more. So that's what has been inspiring me lately! 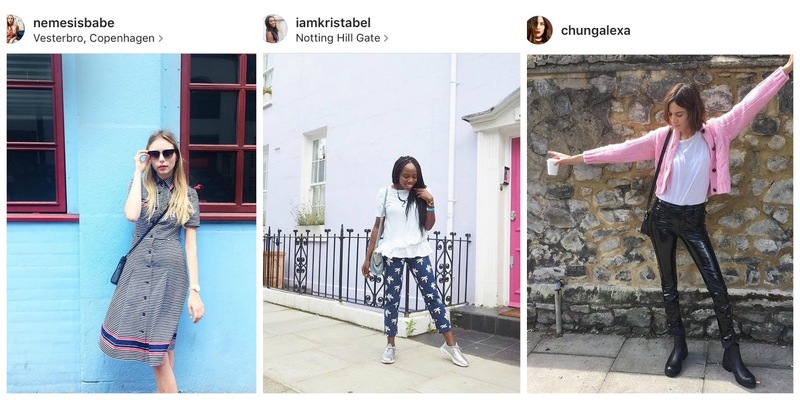 I really enjoyed writing this post and having a scroll through the outfits I've been loving at the mo, I might make this a regular kinda post because I definitely follow enough bloggers and inspirational, stylish ladies to do so! Let me know if you enjoyed it!